Colombian volcano is expected to erupt, prompting evacuation! Colombian emergency officials have begun evacuating 800 families from an area at high risk from the expected eruption of a volcano that killed at least six people in November. 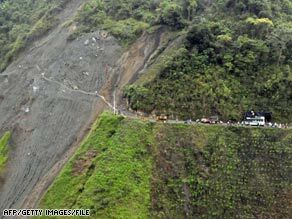 Colombians make their way across a landslide in November after the Nevado del Huila volcano erupted. The Nevado del Huila volcano is on orange alert, meaning an eruption is probable within days or weeks, the Colombian Institute of Geology and Mining said last week. An eruption would cause an avalanche down the Paez and Simbola rivers, officials said. The town under evacuation, Belalcazar, sits on the bank of the Paez River about a half-mile (less than a kilometer) from the junction with the Simbola River. It was the worst-hit area in November's eruption. The volcano's crater holds 52 million cubic meters (1.8 billion cubic feet) of lava, said Colombia's Caracol Radio. That's the equivalent of 13.8 billion gallons. The Colombian national emergency agency said Monday it is ready to evacuate thousands of residents if the volcano's condition turns to red, which means an eruption is imminent or ongoing. The snow-capped Huila, the highest active volcano in Colombia, last erupted on November 20. At least six people, including four children, died then. Gas and hot ash caused snow on the mountain peak to melt, sending mud, rocks and floodwater rushing down the Paez and destroying at least 20 homes and washing out five bridges, the presidential office said at the time. Much of the sparsely populated region about 155 miles (250 kilometers) southwest of Bogota is a reservation for Nasa indigenous communities. All six fatalities were native Indians, the government said. The youngest victim was a year old. The Huila volcano, which has a summit of 17,598 feet (5,364 meters), has erupted four times. The first documented eruption occurred in the 1500s, then it stood silent for more than 400 years, according to the Web site volcanolive.com. Colombian emergency officials said Monday they are asking the 800 families where they want to be moved to, Caracol Radio said. Scientists with the Colombian Institute of Geology and Mining, commonly known as Ingeominas, said they did not detect any major action inside the volcano Monday, Caracol reported. Ingeominas and the National System for Emergencies are monitoring the volcano around the clock and have acquired new equipment, including additional telecommunication gear and an infrared camera to monitor Huila's temperature. Officials also plan to install a microphone on Huila to detect any new rumblings from inside the volcano, Caracol said. Officials already are monitoring the volcano with four stations that detect seismological activity, a video camera, a communications network and a system that measures mudflow, Caracol said. Mount Redoubt is under observation! It's been nearly 20 years since Alaska's Mount Redoubt erupted, but that time of tranquility might end. The 10,197-foot peak sits about 50 miles west of Kenai and 100 miles southwest of Anchorage. It last erupted during a five-month stretch beginning December 1989. Twenty years ago, an eruption forced mud flows from Redoubt into the Drift River drainage. The flows also caused partial flooding of the Drift River Oil Terminal facility. Additionally, the ash plume disrupted international air traffic and a thin ash layer coated Anchorage and surrounding communities. Sunday's volcanic activity came on the heels of a magnitude 5.7 earthquake at the mouth of Cook Inlet. However, Schneider said that does not necessarily mean the earthquake stirred the volcanic activity. With the two events being more than 100 miles apart, it's even more unlikely, he said. One of the most active volcanoes in the world, the Etna, is throwing away today ashes and lava that descend the western face towards the Bove Valley. The eruption, initiated last May, is visible from a long distance, underlined the National Institute for Geophysics and Volcanology of Catania that is responsible for the monitoring of the crater formed almost in the top of the Italian giant. According to the Institution, the phenomenon does not represents any danger for the population, however is permanently watched due to its constant internal movements. According to historical references, in year 122 BC took place a great activity that destroyed the Catania region. A possible new eruption of the Nevado del Huila volcano forced authorities to evacuate villages and settlements at risk of being flooded in case of an eruption. The mudslide following an eruption of the volcano in November last year killed several people and destroyed a large part of Belalcázar, a town on the banks of the Rio Paéz. About 4,000 people living near the river are now evacuated. Disaster authorities are monitoring the volcano and will evaluate how long the people will be forced to stay away from their homes. Is Kilauea's eruption coming to an end? Is Kilauea’s summit eruption pau—coming to an end—as the New Year begins? This question is currently under discussion at the U.S. Geological Survey Hawaiian Volcano Observatory (HVO). According to Jim Kauahikaua, HVO Scientist-in-Charge, several lines of evidence confirm a decrease in activity at the vent in Halema‘uma‘u Crater. In early December, the gas plume emitted from Halema‘uma‘u became wispy and translucent, a marked change from the opaque white or brown plumes that billowed from the vent in previous months. “The recent rains changed the plume’s appearance, so it looks a bit denser now,” said Kauahikaua. Using an infrared camera that can “see” through the gas plume, HVO geologists noted on December 31 that a previously open conduit in the Halema‘uma‘u vent was filled with rubble, or rocky debris from collapse of the conduit walls. The camera also shows that vent temperatures are greatly diminished, perhaps to pre-eruption temperatures. Sulfur dioxide emission rates have dropped to their lowest values since late 2007. Recent heavy rain converted small amounts of the sulfur dioxide (SO2) to hydrogen sulfide (H2S), so nearby residents may have noticed a slight rotten egg smell in the air last week. " We’ve also seen changes in the tephra, or volcanic rock fragments, ejected from the summit vent during the past month," said Kauahikaua. "On December 5, more than half the tephra erupted was derived from molten lava. Two weeks later, the amount of tephra was much smaller and consisted almost entirely of rock dust derived from older, pre-eruption rocks in the vent walls." Kauahikaua added, "If an eruption is defined as a volcanic event that deposits solid material on the ground surface, then the Halema‘uma‘u eruption stopped in mid-December." He cautions, however, that the summit vent remains in a state of unrest. Sulfur dioxide emissions, measured at 770 tonnes per day on January 7, are still elevated compared to pre-2008 background levels. Seismic tremor beneath Kilauea’s summit also remains elevated. "The eruption may have paused, rather than ended," Kauahikaua concluded. "We can’t rule out the possibility that the eruption will resume, so HVO scientists continue to carefully monitor the summit vent in Halema‘uma‘u Crater." Daily updates for the summit and east rift eruptions are posted on the HVO Web site at http://hvo.wr.usgs.gov. There has been an increase in volcanic activity at Montserrat’s Soufriere Hills, with ash being thrown more than 12 kilometers high and scattered throughout the entire island, forcing at least 70 residents to remove to other locations. Soufriere Hills VolcanoTwo explosions occurred on Saturday and, according to reports, the instrument that usually monitors the volcano did not give warning of the eruptions. The Antigua Sun reported that Dr Nico Fournier of the Volcano Observatory said that within the next few days he would be able to ascertain if there would be further eruption. During the past 14 years the volcano has erupted several times, forcing residents to evacuate their homes and entire towns and migrate to the United Kingdom, Antigua, the British Virgin Islands, and other areas. The first eruption was in July 1995 and two years later there was a big explosion, which buried the capital Plymouth and claimed the lives of 19 people. A large number of Montserrat nationals went to the United Kingdom where they were given full residency and they became British citizens in 2002. Some went to nearby Antigua and others removed to the British Virgin Islands and other Caribbean islands. Is there a link between volcanic eruptions and the tropical climate cooling down? Big volcanic eruptions cooled the tropics over the past 450 years, an effect masked by rising global temperatures, says a new study.Scientists already agree that large eruptions have lowered temperatures at higher latitudes in recent centuries, because volcanic particles reflect sunlight back into space. For instance, 1816, the year following the massive Tambora eruption in Indonesia, became known as 'The Year Without a Summer', after low temperatures caused crop failures in northern Europe and eastern North America.More extensive evidence comes in part from tree rings, which tend to grow thinner in years when temperatures go down. This is one of the first such studies to show how the tropics have responded, said co-author Rosanne D'Arrigo, scientist at the Tree Ring Lab at Columbia University. 'This is significant because it gives us more information about how tropical climate responds to forces that alter the effects solar radiation,' said D'Arrigo. The other co-authors were Rob Wilson of Lamont and the University of St. Andrews, Scotland and Alexander Tudhope of University of Edinburgh.Along with tree rings, the researchers analysed ice cores from alpine glaciers, and corals, taken from a wide area of the tropics.When the earth cools, not only do trees tend to grow less, but isotopes of oxygen in corals and glacial ice may shift. All showed that low-latitude temperatures declined for several years after major tropical eruptions.The samples, spanning 1546 to 1998, were taken from Nepal down through Indonesia and across the Indian and Pacific oceans; the ice cores came from the Peruvian Andes. The researchers used materials they collected themselves, as well as samples from the archives of other scientists.The data show that the most sustained cooling followed two events: an 1809 eruption that probably took place in the tropics, but whose exact location remains unknown; and the 1815 Tambora eruption, one of the most powerful recorded in human history, according to a Columbia university release. 'Particularly warm decades may have partially overridden the cooling effect of some volcanic events,' said D'Arrigo. 'This study provides some of the first comprehensive information about how the tropical climate system responded to volcanism prior to the instrumental period,' she concluded.The findings were published in the current issue of Nature Geoscience. It would be an American disaster scenario but Yellowstone National Park is long overdue for a monster eruption that could leave as much as half the U.S. under a blanket of ash. In Russia, as the new year closes in, the Koryakski volcano to the far east of Russia has started to erupt emitting ash which could threaten local populations. Volcano Eruption Concerns in Yellowstone and Russia While the Yellowstone volcano eruption is not immanent, in Russia thee is concerns. The BBC has video here and reports, "Russia's Koryakski volcano on the eastern Kamchatka Peninsula has erupted sending ash 6,000 metres (20,000 feet) into the air, according to the local geophysics service." ***The report notes that in the past 24 hours, about 170 tremors have been registered near the volcano. The last major eruption occurred 3,500 years ago. There are more than 150 volcanoes on the peninsula, 29 of them active. In the US, what would happen if the volcano erupted in Yellowstone? According to gene Byrd, "Half the country could be covered in ash up to 3 feet deep. Should you be worried? Consider this, "Yellowstone seems to blow its top about every 600,000 years."